Mr. Kyriakopoulos is a graduate in Business Administration of The Athens University of Economics and Business Studies and holds a degree in Business studies from the City of London College and in Marketing from the British Institute of Marketing. He joined Viohalco in 2006, and since then he has held various managerial positions, including Chief Financial Officer of Viohalco and Vice President of non-ferrous metals. 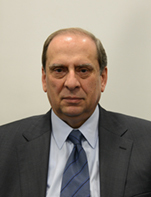 Prior to joining Viohalco, he had a long career with Pfizer/Warner Lambert, serving as President Europe/ Middle East/ Africa of Adams (Pfizer's Confectionery Division), as Warner Lambert's Regional President Consumer Products Italy, France and Germany, Regional Director Middle East/ Africa and Chairman and Managing Director of Warner Lambert Greece. He has also being Deputy Managing Director of Hellenic Duty Free Shops.